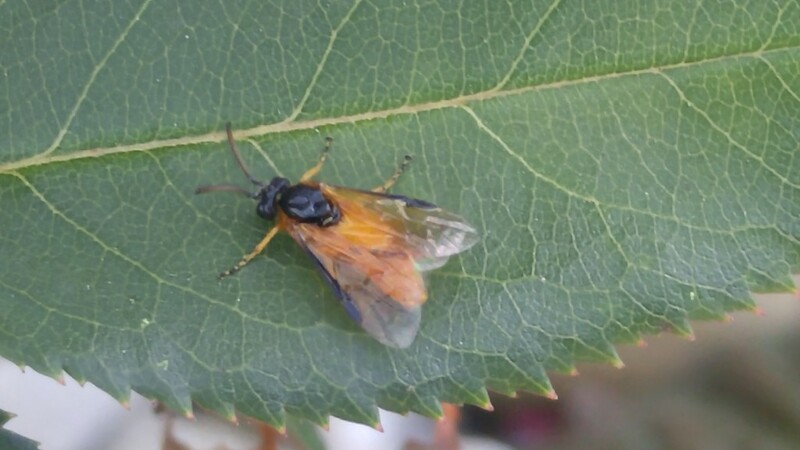 If you ever grew roses you probably have seen those ugly, slug-like rose sawfly larvae eating leaves on your roses, or at least the damage they do. That’s the way we usually see them, as larvae. Rarely are the adult insects ever seen by gardeners. Rose slugs feed on one side or the other of the leaves, usually it’s the underside. When they first hatch from the eggs and while they’re growing, the slugs are very small so they have very small mouth parts. That means they can’t take very big bites and only able to eat the softer leaf parts leaving the tough veins of the leaf. And they only eat one surface of a leaf leaving the other side intact. This results in a characteristic “windowpane” feeding pattern. Later as the leaf parts dry, the windowpanes turn brown and fall out. It’s not unusual for an entire rose bush to be defoliated like this. 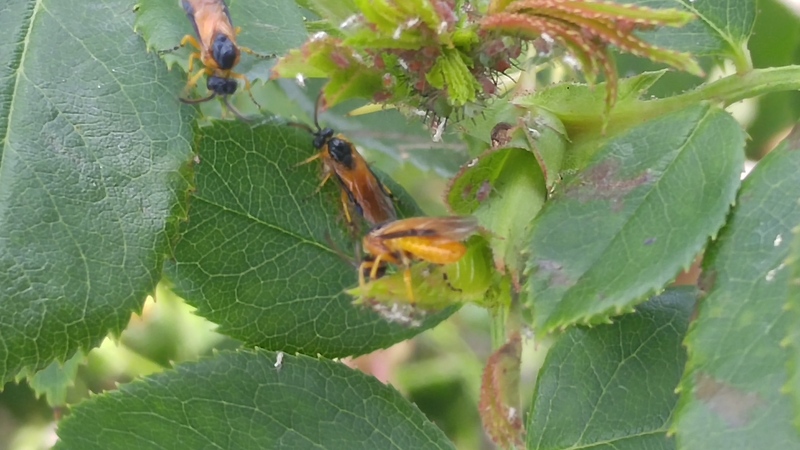 Last week, on some ‘Knock Out’ roses, I witnessed a surprising phenomenon, a swarm of rose sawfly adults. It was a frenzy of activity, hundreds of them flying in and out the the rose branches stopping only briefly to mate. They would swam all over one bush then move on to the next until they visited all nine rose bushes. The way they were flying really looked a swarm of bees or wasps. That should not be too surprising since they are are members of the insect order Hymenoptera which includes bees, ants and wasps among others. Unfortunately, I wasn’t able to capture a video for you but I got a few photos. The adult sawflies do not chew on buds. Sawflies were on every part of the plant. The entire event lasted about two hours, then they were gone, with just a few stragglers left behind. 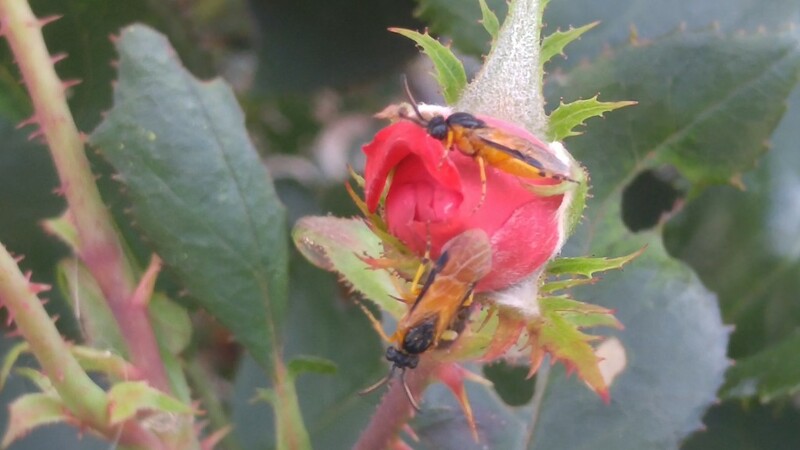 I assume they laid eggs on the rose plants during all that activity. I’m expecting a huge outbreak of rose slug larvae from them. When all that was going on, I was thinking that I had two choices: I could spray all of those sawfly adults as they were buzzing around and destroy them right then and there; or just leave them alone to see what eventually happens. 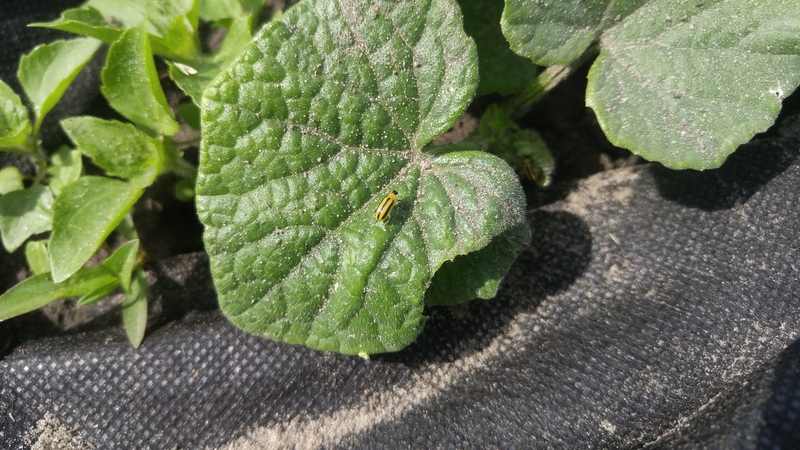 Actually, since I didn’t have any insecticide or sprayer at the time, the decision was already made. This will be an unintended but interesting experiment. I’ll let you know how it turns out.